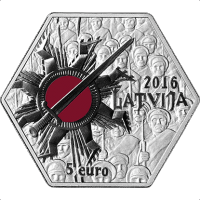 The obverse shows the image of a stylised sun from the badge of the Latvian riflemen battalion soldiers with its central field painted red, eight broken sunbeams and a slantwise-situated sword on the background of a group of Latvian riflemen. The year 2016 is on the right with the inscription LATVIJA underneath, and the inscription "5 euro" is placed at the bottom part of the obverse. 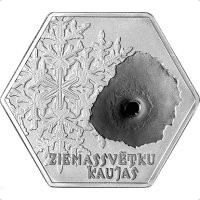 The left side of the reverse is covered with snowflakes, while the right one features a point of the bullet impact, with the inscription ZIEMASSVĒTKU KAUJAS (CHRISTMAS BATTLES) placed at the bottom. "Gather under Latvian flags!" These passionate words by the writers Atis Ķeniņš and Kārlis Skalbe introduced the patriotic appeal to form volunteer riflemen's battalions, which on 19 July 1915 was signed by the Russian State Duma deputies Jānis Goldmanis and Jānis Zālītis. In 1915, World War I had reached Latvia, and refugees from Kurzeme (Courland) and Zemgale (Semigallia) set out for Riga and Vidzeme (Livonia), and many even for points far beyond. The German army was already in the outskirts of Riga, and, therefore, the military leadership of Russia resolved to allow for the formation of national units. Thousands applied to become riflemen, and their choice was passionately supported by the nation hoping for territorial autonomy to be attained sometime in the future. "Brothers, it is better to join the fighting instead of perishing along alien roadsides! As always, let us remain faithful to the land of our fathers in this dark hour. Let us forge its destiny ourselves!" What the budding riflemen had heard and stored away in their hearts soon had to be confirmed with their blood when the command of the Russian 12th Army made plans to push the German troops across the Lielupe and begin the recovery of Zemgale. Two brigades of Latvian riflemen (eight regiments), riflemen from the 6th Siberian Corps and some other units were involved in accomplishing this task. Latvians were united in one division under the command of major general Augusts Ernests Misiņš (1863–1940) who later became the first general of the Latvian army. The Christmas Battles began and raged 5–11 January 1917 (according to the old style, 23–29 December 1916), with the front line stretching for 30 kilometres from Tīreļpurvs to Olaine. During the sudden, blizzard-cloaked attack on the German positions, the riflemen encountered the latest cruel innovations of war. The development of defence technologies then surpassed the means of attack. The outdated and irresponsible tactic of frontal attack ended in huge casualties. The Latvian regiments lacked artillery support. They were forced to run through extensive traps of barbed wire and expose themselves to massed fire of countless German machine-guns. The situation was exacerbated by a severe cold spell. Yet the Latvians managed to break through the substantial defence system of the enemy and drive a wedge of several kilometres through German lines, taking even the most menacing German fortification, Ložmetējkalns. And yet the attack petered out, because the leadership of the Russian 12th Army had not prepared further plans. As the attacks subsided, the German forces immediately launched a counterattack, partially reclaiming their lost positions in January battles. In these battles, Latvian riflemen suffered about 9 000 casualties – the dead, the wounded and the missing, and more than half of those in the Christmas Battles. The losses fomented depression, hopelessness and bitter disappointment with the tsarist regime. For the Latvian riflemen, however, the Christmas Battles brought international fame as outstanding and fearless warriors. It was a kind of statement and proof of national vitality, a noble sacrifice on the altar of the dream about the would-be State of Latvia. In this sense, sacrifices were not in vain. "He who believes, celebrates victory. March ahead under the Latvian flag for the future of Latvia!" To commemorate the heroes of the Christmas Battles and their eternal contribution to the future, a special collector coin has been struck, immortalising gazes of fearless eyes and wounds inflicted by bullets.